As we discussed in our introduction (July 2013), the ‘New California Garden’ involves designing a home garden around existing conditions – what we like to think of as a site’s ‘natural assets’. This series is aimed primarily at California gardeners, but the principles are applicable wherever you live; they are, quite simply, the principles behind sustainable gardening. The key point is this: get to know your garden’s ‘natural assets’ then choose plants and hardscape appropriate for these assets. The result is a healthier, more sustainable and often more interesting landscape. Site physical conditions will be different for each garden; that’s why each gardener needs to discover his/her site’s own assets before considering a garden design. Site characteristics include such things as soil type and drainage, sun and shade patterns, wind, temperature and even views (good or bad). You need to assess these site assets before you plan your garden so you can take advantage of them. This post will walk you through the process. Several physical characteristics have the most effect on plant suitability and plant health. These include: precipitation and precipitation patterns; soil texture and drainage; the amount of light (sun and shade); temperature; and wind. We discuss each of these in a separate section, below. You will find there’s lots to learn about your garden – information that will actually make your gardening easier. http://www.slideshare.net/cvadheim/physical-characteristics-of-your-site-summary (site summary) and http://www.slideshare.net/cvadheim/soil-characteristics-of-your-site-summary (soils summary). You will also create several maps that will help you design your garden on a solid basis: a soils map (if needed); a sun and shade map; and a map (or two) with other physical features. 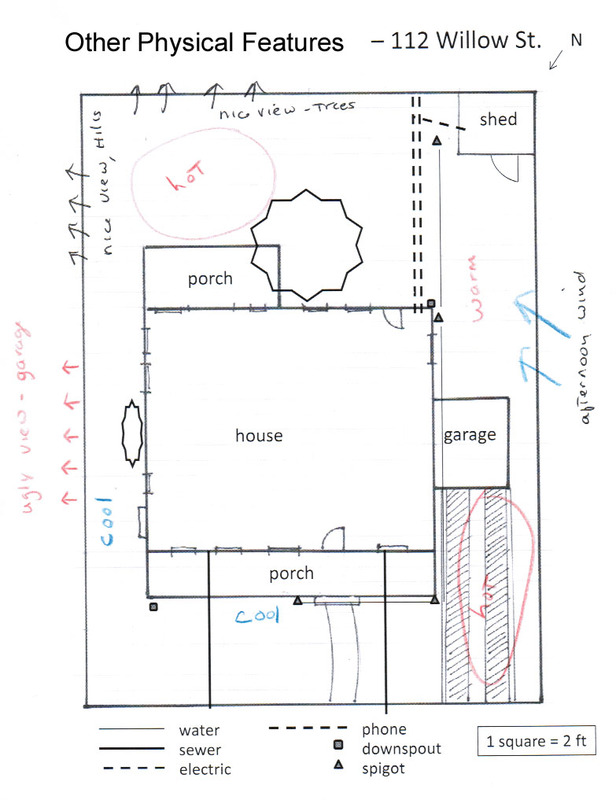 If you don’t yet have a good base map for your garden, see our July posting: Designing Your New California Garden: Creating a Base Map. Nothing influences plant growth like the amount and pattern of precipitation. You probably have a basic understanding of precipitation in your area. But as climate changes, and water becomes more scarce (at least in the U.S. Southwest) you need to take a careful look at precipitation patterns over time. As you know, precipitation can vary widely by geographic area. Consider purchasing an inexpensive rain gauge and tracking precipitation in your own backyard. Check with your neighbors. You may have a helpful neighbor with precipitation records going back years or even decades! These will provide a better indicator of your neighborhood’s precipitation than any other source. 2. Soil type and drainage. http://www.slideshare.net/cvadheim/soil-characteristics-of-your-site-summary) and place it in your Garden Planning Notebook. Three main factors influence how well a plant will do in a given location: soil moisture, temperature extremes and the amount of sunlight/shade. We tend to think of CA native plants as being ‘sun lovers’, and this is true for most plants in some plant communities (for example, desert communities). But most California plant communities include a combination of sun- and shade-loving plants. The Shade-lovers will be found growing in the shade of trees and shrubs, in the bottoms of canyons or forests and on north-facing slopes. There are many degrees of shade – both in nature and in the garden (definitions are given below). The trick is to match the light requirements of the plants to those of the garden. Shade is often viewed as a deterrent to gardening, which is unfortunate. While shady areas do present unique challenges, lovely native plant gardens can be created in lower light environments. In fact, shade gardens have many special attributes and advantages. The lower light intensity creates a calm, peaceful atmosphere, a restful place. As the hot sun beats down, toasting the ground and wilting everything in site, a lush green shade garden becomes a paradise, a refuge from the scorching temperatures of a summer day. Shady spots are more enjoyable to work in during the heat of the summer. Depending on the site and plant selection, these sites may require less watering as there is less water evaporation. In a shady garden the play of light and shade, ever-changing throughout the day and from season to season, adds to the beauty of the garden. To really understand your garden’s patterns of light requires close observation, ideally in winter, spring and summer. Mapping your garden’s light conditions means you'll need to spend some time outside in your yard. Of course, you could break this down into three or four parts over three or four days; on the other hand, this is a great opportunity to really enjoy being outside. Even if you think you know your garden we guarantee you will be surprised by your results! And once you’ve created a good Light & Shade Map you will find it much easier to select suitable plants. While you may be tempted to just guess at the light conditions, we highly recommend taking the more methodical approach. Our own experience taught us that while we thought we knew our gardens’ shade, we really didn’t! We found that unless you actually observe the shade patterns, you may forget crucial factors such as the shade cast by walls, umbrellas and other shade-makers; or underestimate the amount of morning sun hitting plants under your trees. Start with a copy of Base Map 2. You will map the shaded areas at 9:00 a.m, noon and 3:00 p.m. Note the date of the shade map since light and shade patterns vary with the season. At 9:00, noon and 3:00, draw a line roughly showing where the sun is touching still (or where the shade begins) in each area of the yard. Note also areas of Deep shade and High/dappled shade (see table below for definitions). At the end of the day you'll be able to construct your final Light and Shade Map, which maps the shade regimens for each area of the garden. See an example, below, of a Shade Map done on August 21st . Bear in mind that some factors affecting sunlight patterns will change during the course of the year. So, to really understand the light patterns in your garden you may want to re-map your garden in summer and winter. A south facing wall that can break 130 F on a good day, like a south wall in Bakersfield, Palm Springs, even parts of the inland valleys & inland empire. This is a pretty tough regimen for most plants. Only plants from desert communities can survive. A reflective wall in the mountains or cooler areas along the coast; full sun everywhere else (at least 6 hours/day). Can be a challenge in the interior, nice near coast. Often along walls. Good light; not as hot and intense as afternoon sun. Fine for plants that like partial shade. Ribes, Heuchera and many other north slope plants tolerate this exposure. Shade created by tall, open trees or a north-facing wall. Fairly bright light, but direct sun is minimal for any length of time. A wonderful type of light! Hospitable to many sun and shade loving plants from nearly all plant communities. No direct sun for at least half the day. Darker than high shade – often on N side of taller buildings. Shade-loving plants. Shade-loving plants, primarily from Oak Woodland, Riparian and Forest Communities. Quite dark the entire day - for example, under very dense evergreens. Not much grows here. Local temperature information is readily available on the internet for many areas. We suggest downloading a table or graph of the average monthly high and low temperatures for your local area. This will help you realistically plan your garden. It will also let you know when you’ll likely be able to plant in your area. As with precipitation, temperature can vary greatly over short distances. In fact each garden has its own temperature microclimates, influenced by buildings, walkways, plants and physical structures as well as wind, shade and other factors. You may have already noticed areas that are warmer or cooler than the rest of the garden. You can use temperature microclimates to your advantage by planting plants that require more – or less – heat than is found in the rest of the garden. Get out into your garden and notice the temperature patterns. If it’s summer, now is a good time to discover pockets of heat in the garden. If it’s winter, observe which areas are noticeably warmer or cooler (there may be as much as 10° F (5° C.) differences across the garden). Note the differences on your Site Summary Sheet and map the areas on your map (see example, below). Landscape topography refers to the high and low places in the garden. High points may be as dramatic as actual hills or the tops of steep slopes. More often they are subtle, representing elevation changes of only a few feet. Low places in some gardens may include natural canyons, streambeds or the bottoms of steep slopes. In many gardens the low areas also are subtle – but they are enough to affect drainage patterns. The topography may be either natural or man-made. Landscape topography is most important for its effects on soil moisture. You may have noticed low areas in your garden that tend to retain moisture longer – or high areas that dry out more quickly. You’ll want to take advantage of these differences in topography by planting species appropriate for the soil water conditions they provide. 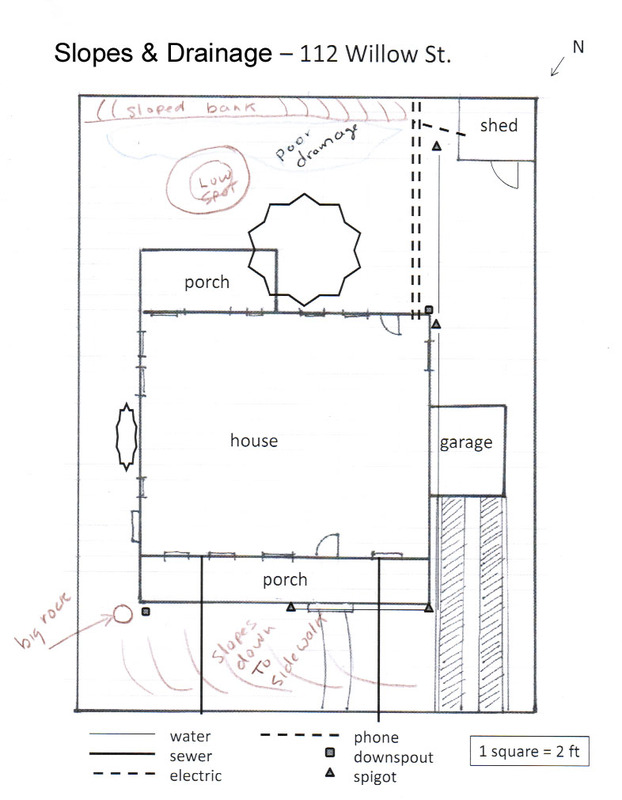 The first step, of course, is to map significant garden topography on your Physical Features Map (see example, above). To learn more about site topography see our posting Getting to Know Your Garden’s Soil: Soil Topography (Dec. 2012). Wind can play an important role in some gardens. Some areas have high winds at certain times of the year. Other areas may have cooling sea breezes most afternoons. Still other gardens may experience hot, dry winds in the fall or spring. All of these wind patterns may influence the type of plant that will thrive in your garden. Wind also provides air circulation. This is often a good thing, particularly in gardens where soil moisture can provide the perfect conditions for garden fungi during warm weather. Get out in your garden and observe wind/air flow patterns over several days. Be sure to observe these patterns at different times of the day. Are there areas that are particularly breezy? Areas where the air doesn’t move at all during the day? Map these on your Physical Features Map. Think about the yearly patterns of wind in your area. Are their times of significant high winds? Have these effected local gardens in the past? Note this also on your Site Summary Sheet. You’ll need to plan for wind when you design your garden and choose your plants. Other physical features include anything else that will influence your landscape design. These will vary greatly from site to site. One yard may have commanding vistas that should be featured in the landscape design. Another may have unsightly views which should be screened. These features (and any other physical features) should be mapped on your Physical Features Map. Some sites have unique physical features that could be highlighted in the garden design. These include cliffs, large rocks/boulders, natural outcrops, ponds, streambeds and many other features. 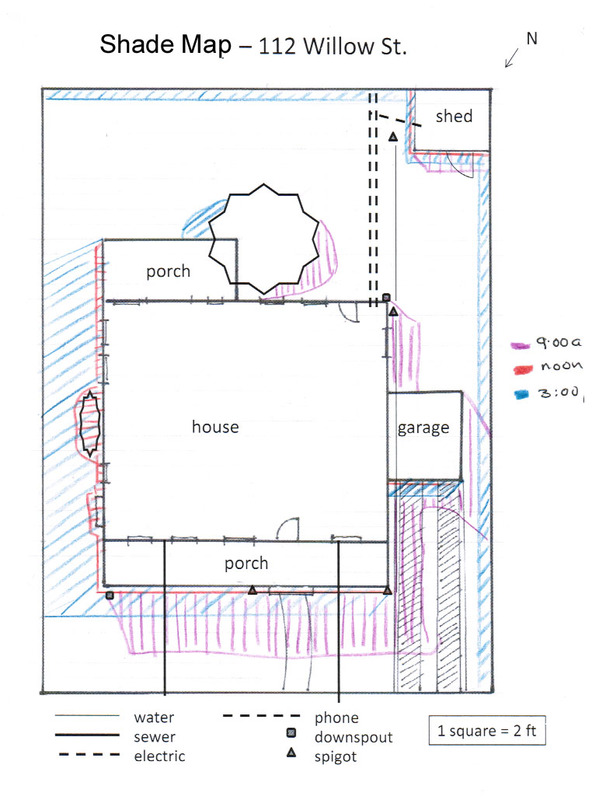 You may want to design your entire garden plan around significant physical features. Include any such features on your map. Have you noticed some large, bumbling green beetles in your yard recently? They are most common from late July through September in the Los Angeles Basin - and so large you simply can’t miss them! They’re raising quite a lot of interest now in Mother Nature’s Backyard. The Fig Beetle is a true beetle, member of an extremely common group of insects (beetles account for about 1/5 of all animal species on earth). Unlike other insects, the delicate inner wings of beetles are protected by a pair of tough outer wings, the elytra. When beetles fly, the elytra spread apart, allowing the membranous flight wings to unfold. The Fig Beetle is a scarab beetle (Family: Scarabaeidae), a group that plays an important role in recycling organic matter (more on that later). More specifically, Green Fig Beetles are part of the subfamily Cetoniinae, commonly known as ‘fruit and flower chafers’ or ‘flower beetles’. 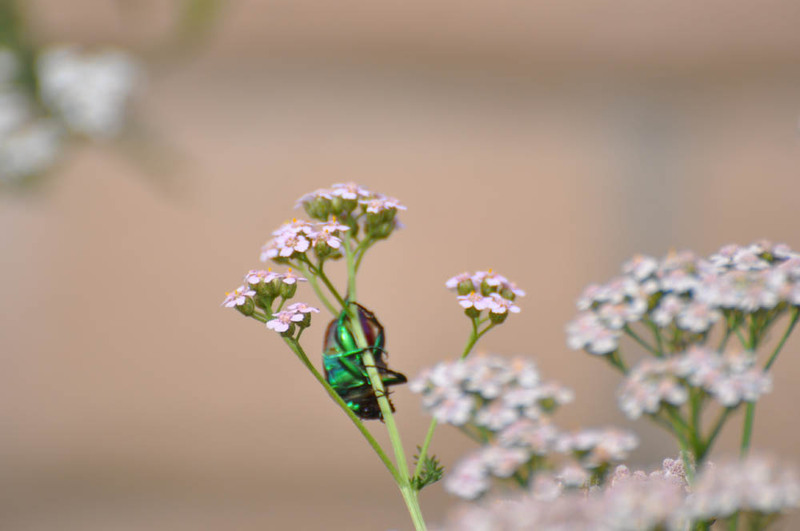 Unlike most scarabs, the ‘flower beetles’ are often brightly colored and active during the day. Not surprisingly, adult ‘flower chafers’ are often seen feasting on flowers and fruit. The Green Fig Beetle is native to Southwestern U.S. and Mexico. The species was likely limited to moister areas of Arizona, New Mexico and northern Mexico in the past. But Fig Beetles have increased their range, first becoming noticeable in coastal Southern California during the 1960’s. They now range further up the California coast and into the Great Central Valley as well. While cactus fruit and the sap of desert trees comprise their native diet, Fig Beetles now feed almost exclusively on garden and agricultural fruits. Green Fig Beetles are large (up to 1.25 inches (3 cm) – in fact they are one of our largest native beetles. 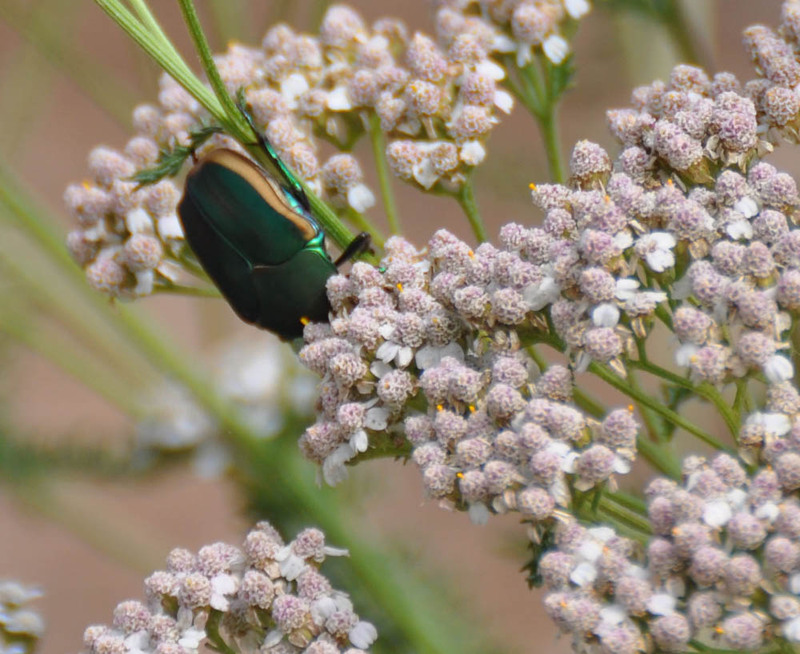 They are often mistaken for Green June Beetles (Cotinis nitida) and Japanese beetles (Popillia japonica). The Figeaters are noticeable larger than June and Japanese Beetles, which are mostly confined to Eastern United States. And they don’t damage lawns and fruit crops to the same extent as their eastern relatives. In fact, Figeaters are not considered an important pest species and are not controlled in California. Figeater Beetles are dark, velvet green on top, with a cream-colored band around the edge of the elytra (see above photo). Their legs and undersides are a brilliant iridescent green. The head has a short, hornlike projection in the front and their legs have hooks for grabbing onto flowers and fruit (see photo below). They are slow fliers and often collide with large objects including walls, houses and even humans. Flying Figeaters make a loud buzzing sound. The sound is likely produced by the Fig Beetle’s elytra, which are partially closed in flight and are only barely raised during takeoff. You can actually see the partially-open elytra in flight – they are truly slow fliers. The Figeater’s armor (the elytra) does provide protection, but it also makes for clumsy flight! Green Fig Beetles don’t bite and are relatively unbothered by humans. This makes them an excellent species for close observation (they are great for teaching children about beetles). They are fairly easy to photograph; you can sometimes even get them to remain in your hand for a short while. Treat them gently and with respect; they are living creatures with a role to play in the garden. Adult Figeaters have a real sweet tooth – they are attracted to anything sweet, including some leaves, flowers, sweet sap and ripe/over-ripe fruit. They cannot bite through the tough skins of many fruits; they usually eat fruits that have been damaged by birds/insects/squirrels – or are over-ripe. Figeaters are attracted by the gases emitted by ripening and fermenting fruits, which serve as an airborne signal. Among their favorite fruits are apricots, pears, peaches, apples, figs, melons, grapes, nectarines, tomatoes and of course, cactus fruits. In many gardens, adult Fig Beetles do little damage (compared to birds and pesky squirrels). However, they can swarm on soft or damaged fruit and have been known to eat an entire garden grape or fig crop. The best prevention is regular harvesting of ripe fruit. Daily fruit harvest is often enough to limit predation to a tolerable level. If your garden has many Fig Beetles, or if they are still eating your fruits, you may want to take some other, relatively simple steps. 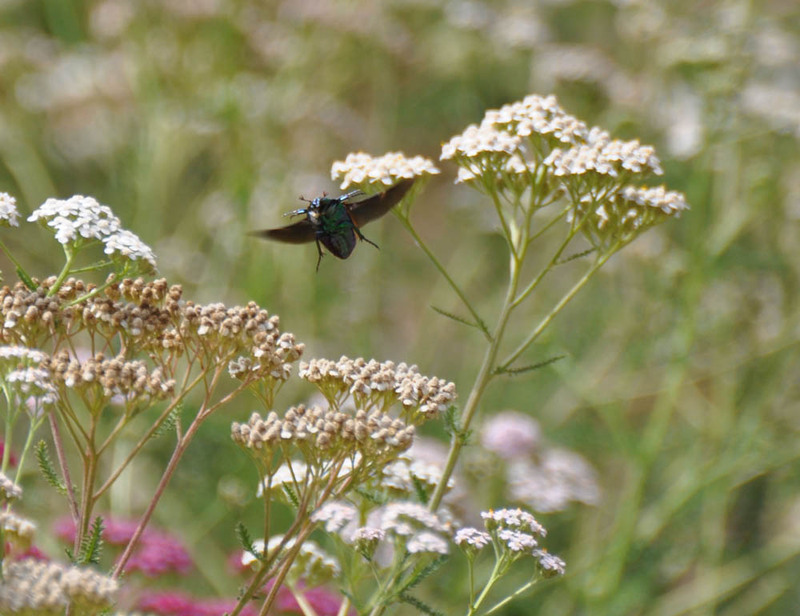 The increase in Figeater Beetles is due in large part to the spread of home gardens. Abundant adult food plays a role. But many local gardens also provide choice larval food for Fig Beetles: compost, composting manure and organic mulch. Adults lay their eggs in the decomposing material in the fall. The beetle larvae then feed on the decomposing matter through winter and spring. In fact, the larvae are important ecosystem ‘recyclers’, along with soil bacteria & fungi. If you live in Southern California you have likely encountered Green Fig Beetle larvae while turning your compost or reapplying mulch. They look somewhat like large (up to 2 inches), fat, pale caterpillars (see above). At rest, they curl up into a stiff C shape. When disturbed – or to move – they roll over onto their backs and propel themselves using stiff, dark back ‘hairs’ and muscle contractions. The common name ‘Crawly Backs’ reflects their mode of locomotion; the small legs are not used for movement. Green Fig Beetles have a single generation per year in local gardens, although they may remain in the soil for two years if food and water are scarce. Larvae typically emerge from the eggs in fall. They live deep in the soil/compost during winter and early spring, eating and growing. Hungry Crawly Backs occasionally consume plant roots, but their primary food is decayed plant matter. Like most larvae, they eat a lot – they literally are ‘eating machines’. They provide a vital service by hastening the decomposition of organic matter and aerating soils and compost. Can you image a garden with no decomposition? Ugly thought! In spring, the larvae migrate upward to begin their second larval stage. They can often be found feeding near the surface and you’ll sometimes see small mounds of soil near the entrance to their tunnels. This period may have consequences for the home garden. Larval tunnels can cause the soil to dry out around plant roots. And the extraction of larvae by several common mammals can leave gardeners at their wits end. 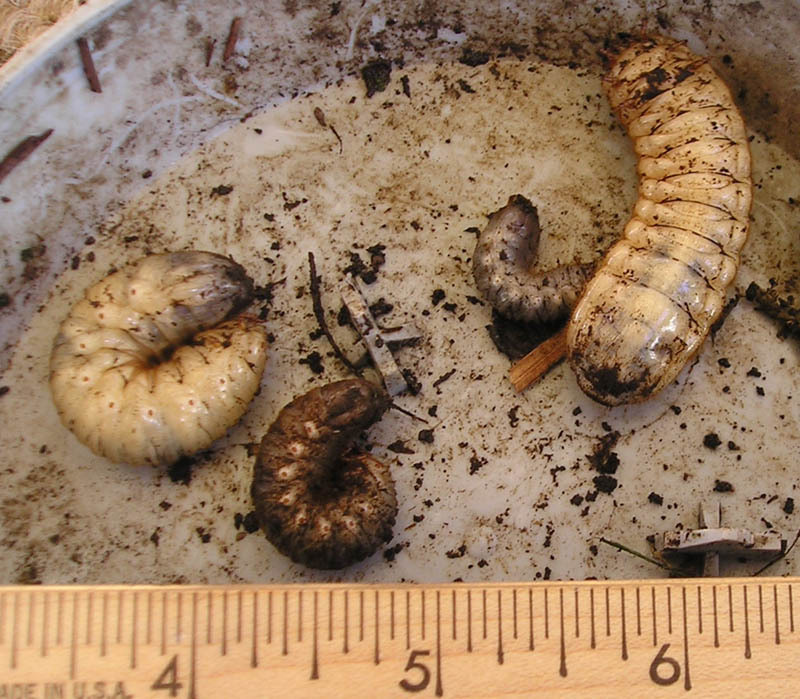 In Mother Nature’s Backyard, raccoons, possums and skunks often dig up the large larvae and eat them. Excavated holes in organic mulch or a lawn are a good indicator that Crawly Backs or other larvae are being eaten in your garden. In late April or May, Figeater larva create an underground pupal chamber with walls composed of sand particles and frass (solid excreta). The larvae pupate (metamorphose from larval to adult form) in the pupal chamber, emerging as winged adults in summer. And so the cycle continues. Some native plants look good all year long. Local gardeners depend on them as the seasons change from rainy spring to dry fall. 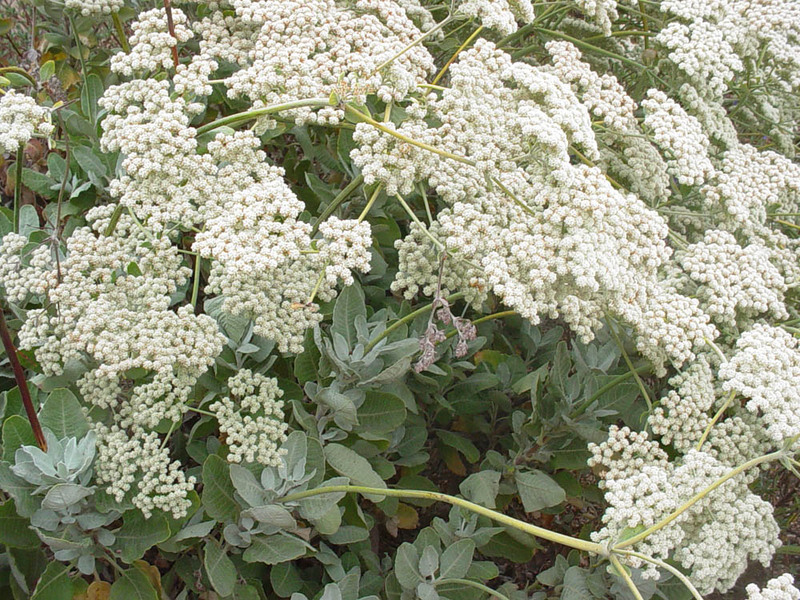 One such garden stalwart is a large native Buckwheat commonly called St. Catherine’s Lace or Giant Buckwheat. Eriogonum giganteum is at the peak of bloom now in Mother Nature’s Backyard. St. Catherine’s Lace is one of several Buckwheats included in our garden. 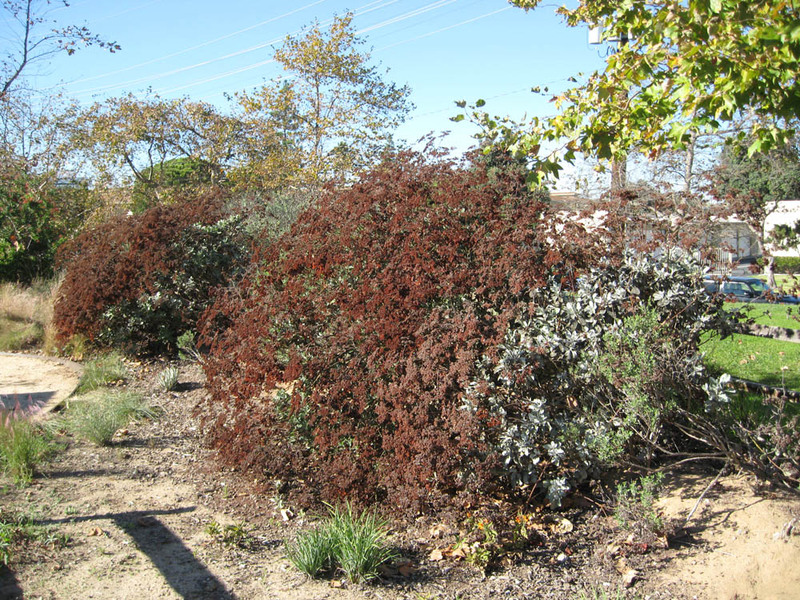 Southern California is blessed with a selection of wonderful native Buckwheat species. They do well in local gardens and are used extensively; they also provide important habitat for insects, birds and other creatures. 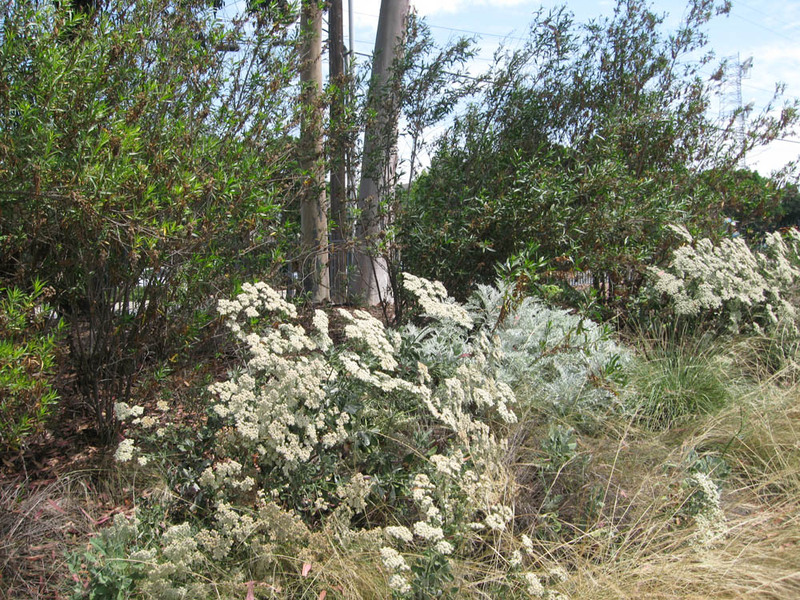 For more on local buckwheat species see ‘Plant of the Month’ for July and November, 2012. Giant Buckwheat hails from the Channel Islands just off the coast of Southern California. There are three varieties (natural variants) of Eriogonum giganteum, each endemic to a different island: var. compacta grows on Santa Barbara Island, var. formosum on San Clemente Island and var. giganteum (the one most used in local gardens) is endemic to Santa Catalina Island. All variants are uncommon in the wild and species of conservation concern. 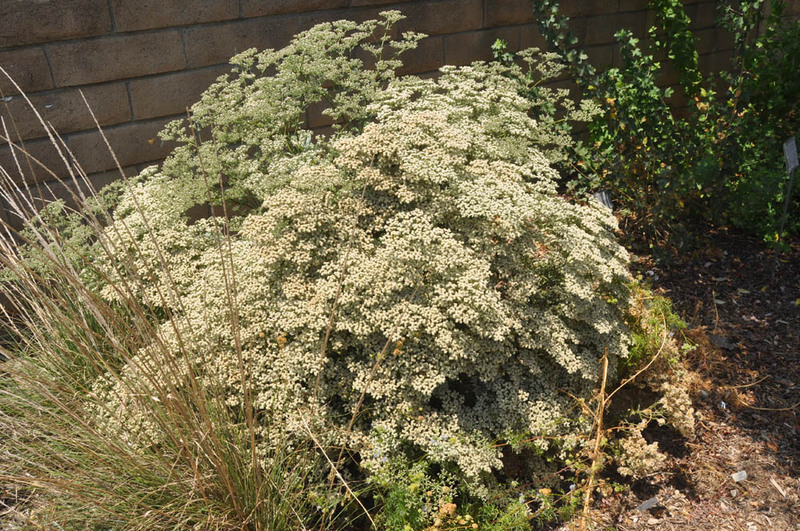 Their rarity – as well as their propensity to interbreed with other native Buckwheats like Eriogonum arborescens (Santa Cruz Island Buckwheat), Ashy-leaf Buckwheat (Eriogonum cinereum) and Eriogonum fasciculatum (California Buckwheat) – has prompted the California Native Plant Society to place all three varieties in its Rare and Endangered Plants Inventory. All forms of Giant Buckwheat grow on dry slopes and rocky cliffs in the chaparral and coastal sage scrub plant communities. They are hardy plants that survive dry summers, nutrient poor soils and blustery coastal winds. They also have the flexibility to thrive under water-wise garden conditions, particularly if left to their own devices. St. Catherine’s Lace is one of the showiest local Buckwheats. 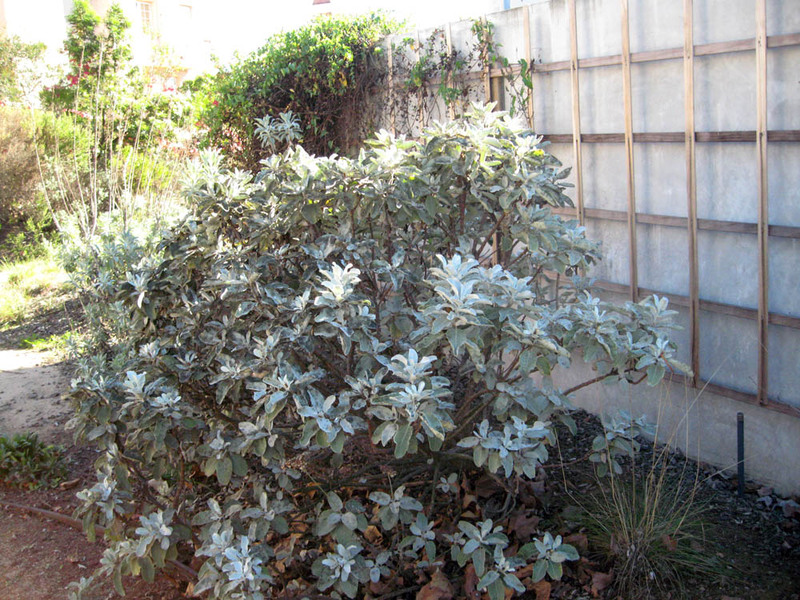 Its foliage is gray-green to silvery white; the foliage is most silvery under dry conditions. The leaves are much larger than most Buckwheats and provide nice contrast to plants with either green or silver foliage (see photo below). In most gardens, occasional water keeps St. Catherine’s Lace evergreen. In the wilds – or with no summer water – the plants are semi-deciduous (lose some leaves). Giant Buckwheat produces loads of small Buckwheat flowers (see photo above). The flowering season is late spring to summer: we’ve seen plants start blooming as early as May and as late as August. The flowers are densely packed in large, rather flat clusters. 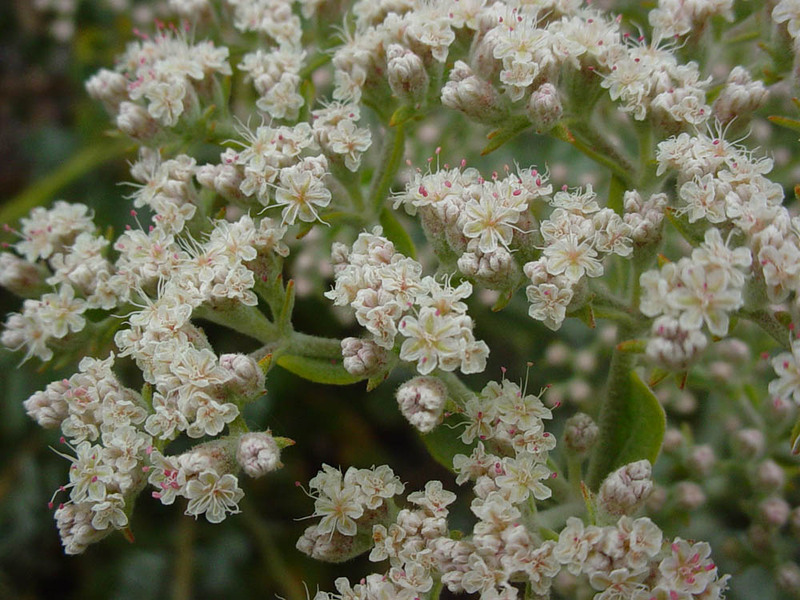 The cluster’s texture suggests a heavily embroidered lace, hence the common name ‘St. Catherine’s Lace’. The young flowers are pink, turning more orange as the season progresses. The flowers are so numerous – and the clusters so large – that this plant is a show-stopper in many gardens (see photo below). Like all Buckwheats, St. Catherine’s Lace is a great habitat plant. The many small flowers, with their abundant nectar, attract a wide range of native insect pollinators including native bees, pollinator flies, wasps and butterflies. 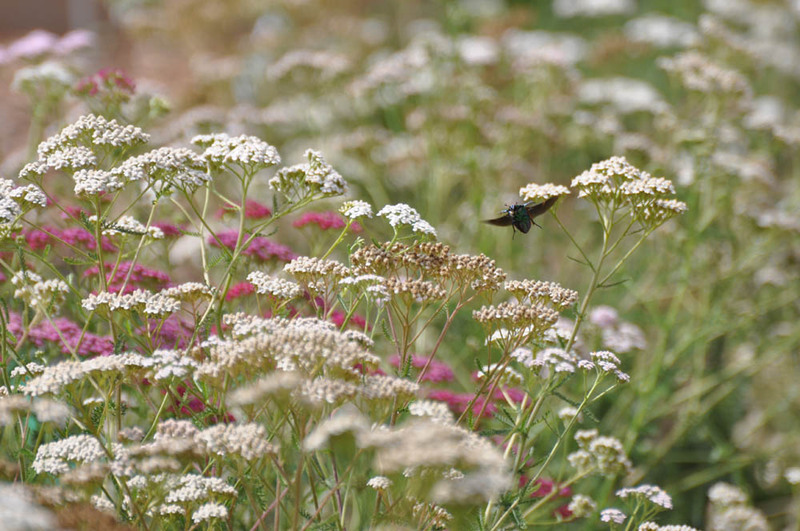 A blooming St. Catherine’s Lace will be alive with insects on a warm summer day. Among the butterflies will be the smaller skippers, acmon blues and gray hairstreaks plus a few larger butterflies. In the fall, the red-brown seeds are a treat for migratory seed-eating birds like finches. What fun to watch on a warm fall day! Mature plants also shelter birds and lizards all year long. St. Catherine’s Lace is the largest of our S. California native Buckwheats, attaining a mature garden size of 5-8 ft. tall and wide. Gardeners should carefully note the size; this is a large plant that needs sufficient space to grow. Choose one of the smaller Buckwheat species if space is limited. Like most local Buckwheats, St. Catherine’s Lace is a sub-shrub, with woody lower stems and herbaceous new growth. The overall shape of mature plants is rounded and dramatic, with several main stems. In fact, this species is best if left to develop its natural form, with only a little shaping. 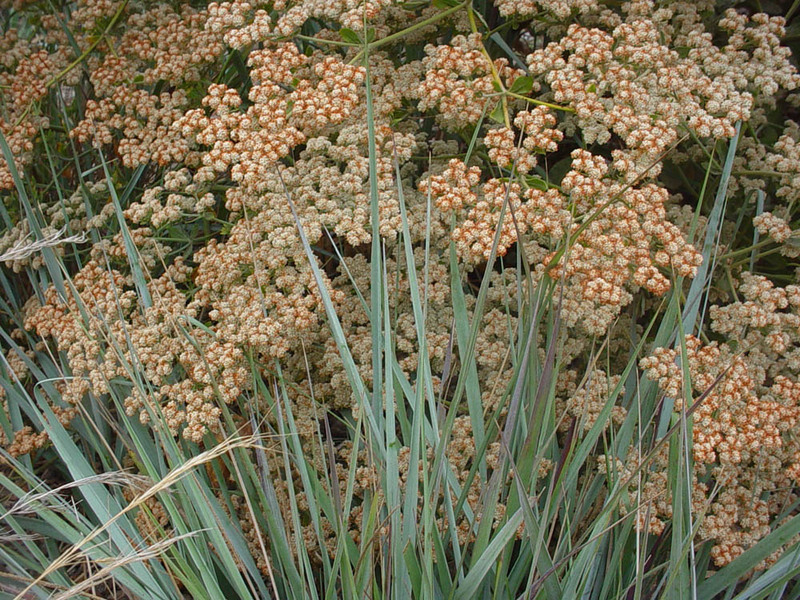 We prefer to leave the orange-brown flower clusters in place until the birds have eaten most of the seeds. The spent flowers provide a nice touch of fall color in the autumn garden. Prune off the dead flowering stalks in late fall for a neater appearance (see above). Often this is all the pruning that’s required. Giant Buckwheat is surprisingly tolerant of garden conditions if not coddled too much. It does well near the coast as well as in hot inland gardens. While its native soils are rocky and well-drained, it thrives even in clay (with judicious summer water) and requires no fertilizer. It does well in full sun or part shade. In fact it is quite easy and adaptable, even growing under eucalyptus trees with their thick natural mulch (see above). Plants require only occasional summer water to look attractive. Let the soils dry out between waterings, then water deeply. In clay soils we usually water once a month or less in summer, depending on temperature and wind. 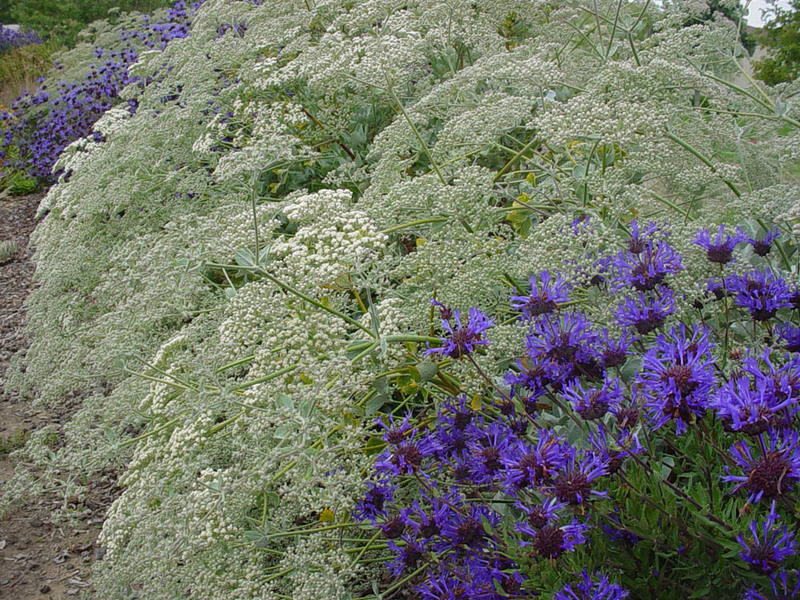 St. Catherine’s Lace looks beautiful paired with Salvias (see above), other Buckwheats, white-foliage plants like Catalina Silverlace (Constancea (Eriophyllum) nevinii) and evergreen shrubs like Coyote Bush (Baccharis pilularis) and Ceanothus. It does well on slopes and can even be grown in large containers. Some gardeners use it for an informal hedge. Its dried flower clusters make a dramatic addition to floral arrangements. And Native Californians used St. Catherine’s Lace for medicines to relieve headaches and stomach aches. As a final note, we return to the observation that native Buckwheats are notorious in their ability to hybridize. The propensity of Buckwheats to hybridize (produce crosses between two species) is both good and bad. Hybridization can be advantageous to wild populations during times of environmental change. In fact, it’s one way that some new species are eventually formed. For the nursery propagator and gardener, hybrids can be a source of plants with new, desirable traits. So easy hybridization does have its positive side. On the other hand, the propensity of Buckwheats to hybridize has plant ecologists worried. 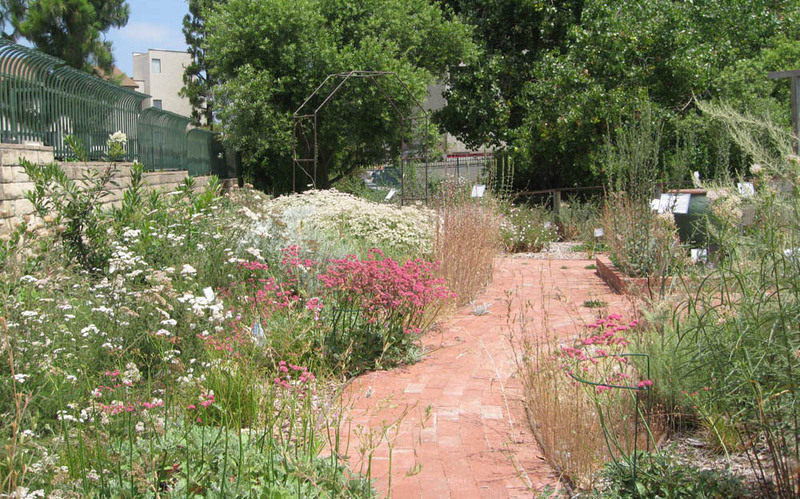 As native gardening increases, plants once separated geographically are now coming in contact. Hybrid Buckwheats are beginning to pop up in home gardens. More alarmingly, hybrids are also occurring among wild populations of Buckwheats! These hybrids are a direct consequence of plants in gardens and highway plantings: bees transport pollen from garden to wild land - and hybrid plants are the result. While hybridization may seem innocuous, the potential consequences are serious. The very characteristics that differentiate one species from another are in danger of becoming lost. Each species has intrinsic value - in addition to its potential as medicine, food or other material. The loss of a species is not something to take lightly; once lost, a species may be lost for good. Some scientists argue that buckwheat species should only be planted within their precise local range. That’s probably a good idea, although a bit late in coming in the case of Buckwheats. At the very least, we should consider the impact of our gardening choices. If you live near (say within ½ mile) of a population of wild/natural Buckwheats, consider planting only plants derived from the local population. That’s a responsible choice; one that will help conserve the local native genes. If you live in an urban area, your choices are more open, but you still might want to choose a local native species over one from further afield. Please feel free to leave a comment, below.